Once more, Cardinal Pell says ‘yes’ to Juventutem! The Most Reverend George Cardinal Pell will celebrate Holy Mass on Friday, October 24. The International Juventutem Federation is pleased to announce that His Eminence George Cardinal Pell, Prefect of the Secretariat for Economy, has kindly accepted our invitation to be the Celebrant at a Pontifical Solemn High Mass according to the Missal of St John XXIII on Friday October 24, 2014, 6:30pm, at Santissima Trinità dei Pellegrini, Parish Church of the Priestly Fraternity of St Peter in Rome, Italy. The Holy Sacrifice will be offered in thanksgiving for the tenth anniversary of Juventutem, the worldwide youth movement fostering the sanctification of the young through the Roman traditions of Holy Mother Church. We are grateful to His Eminence who generously presided at Solemn Pontifical Vespers organised by Juventutem during World Youth Days in the past, first in Düsseldorf on 17 August 2005, and again in Sydney on 16 July 2008. 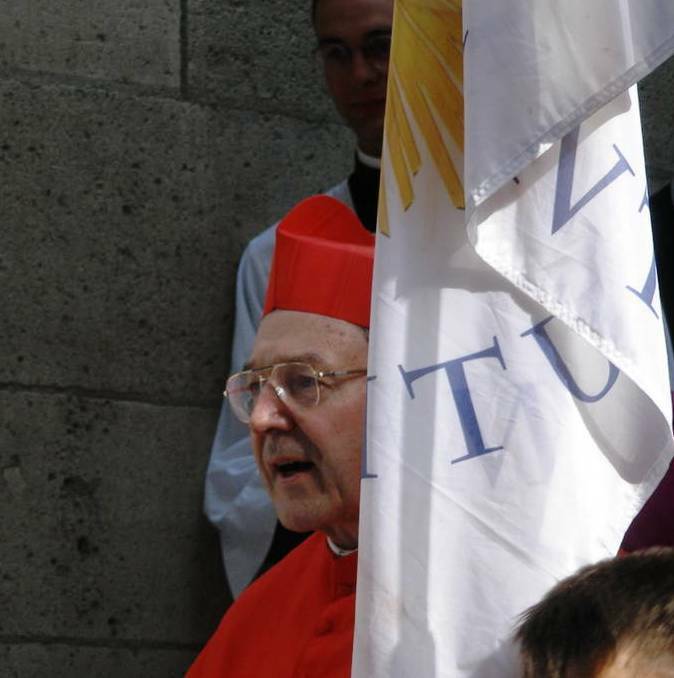 After Vespers in Düsseldorf, Cardinal Pell gave the following encouragements to the young WYD pilgrims of Juventutem: “I am happy to be here because the old Latin rite is one of the most beautiful things in the entire Western civilization. And I am very glad that this ancient rite has its place in the Church today. I am happy because this rite helps you to love God and to love one another. In this ancient rite we always see that our prayer is an act of worship. It is impossible to see a celebration like these Vespers as something horizontal. We have one Church only, whose Head is the Successor of Peter, with the Bishops as successors of the Apostles, and this unity is very important for the life of the Church“. Released by the International Juventutem Federation, on May 27, 2014.